I am a Virginia Tech graduate (for both my bachelor's and master's) and have been an elementary school counselor for FCPS for two years now. I am a die-hard animal lover and have two cats of my own. Throughout my life I have also owned or cared for a large variety of pets/animals. Aside from being a pet owner I have volunteered for the ASPCA and various shelters caring for animals or working adoption fairs. I have also volunteered at Frying Pan Park caring for and feeding barn yard animals. I'm available to come to your home for feedings, walks, medical care, and to visit and play with your pets while you are away! I also do occasional overnight care, and pick-ups/drop-offs. 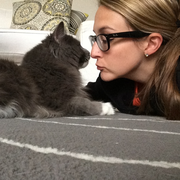 Feel free to check out my personal website for pet sitting: KristenHauck dot com. I always bring in mail, water plants, alternate lights, etc. if applicable. I wish I could give more than 5 stars. My company had an event where we let attendees know that we were going to offer childcare. We asked people to let us know if they'd be bringing their children, and the responses we had only totaled 9 kids. We had one other sitter who was supposed to come and we figured that between Kristin and the other sitter, they could manage 9 kids. Well, the other sitter didn't show, and in the end, our guests brought many more kids. Not sure how many in total as they came and went, but at one point there were 18. Kristen remained calm, provided them all with things to do in 2 areas that she could watch at one time, all while holding an infant for 5 hours. I'd try to check in on her hourly, and she never seemed like things were beyond her control. I find the true nature of a person is not always in how they do the job they've been asked to do, but how they handle unexpected situations. Kristin handled this one with professionalism and ingenuity. Kristen did a wonderful job watching my two cats over the holidays! My cats were immediately comfortable after meeting her for the first time, even my older cat who is usually shy and hides from new people. While I was out of town, Kristen gave me updates on how they were doing through text messages and even sent me pictures of them eating and playing. I was also surprised when I came home to find that my mail had been brought inside and organized and that my apartment was even cleaner than it was before I left. I will definitely be asking Kristen to watch my cats again next time I am out of town, and I highly recommend her to anyone looking for a pet sitter! We hired Kristen to feed our dog and let him out twice daily. We were expressed that she kept us up to date on how our dog was doing while we were away. We were both surprised when we returned home and she had brought the mail into the house. We plan on using her again! This was the first time that I had to hire a pet (cat) sitter so I was a little bit concerned. Well... nothing to worry about when you have Kristen as your pet sitter. She is absolutely reliable and trustworthy. Not only did she leave a written daily comment during the 2 weeks of pet sitting... she also kept me informed via email and text messages and even sent me a picture of my pet showing how relaxed he was. I would highly recommend her!! If you have any questions ask Kristen for my phone number (I don't want to post it here) and I will gladly tell you more about my great experience with her. Kristen has been great from the first contact-she is prompt, professional and very competent! She came over to meet my son and was very easy going and I could tell she is sensitive to families' needs. She sat for us and I felt confident she was able to handle anything a toddler at bedtime could throw at her and sure enough she did! Thanks Kristen! Kristen has watched our now 21-month-old daughter about a handful of times, and is always quick to respond to calls/emails, on time for sitting and really sweet with my daughter. I'm usually very antsy leaving my daughter with anyone outside of close friends and family, but I feel at ease when she's with her. Kristen was awesome - she impressed us on the interview and was really great at taking care of our two very spoiled cats :-) while we were gone for 11 days. She is very responsible and even bought them cat food when they ran out - after confirming the type. She left a list of what she did and what times she was here and the house and cats area was cleaned up. Her communication skills are excellent. I can't say enough good things about Kristen - she is 5+ stars. Kristen is outstanding. My schedule is very tricky, and she has not only accommodated us, she has done a wonderful job with our pets. She spends time making sure both of them have attention, have their meals correctly prepped (which can be a challenge), have had the opportunity to get a really good walk, and even cleans up after them when they've finished eating. She keeps me very well informed, both during visits and with scheduling, and has, in a very short time, earned our complete trust and appreciation. We're lucky to have found her. Happy to provide reference via sci.eng.writer@gmail.com. I highly recommend Kristen. My 2 1/2 year old really enjoyed his trip to the park with her. - Brendan And Diana K.
Kristen did a great job with our daughter. She braved the hurricane and stayed with our four year old. They played games, read books and did a puzzle. When we asked our daughter if she liked Kristen she said "I wish she could come stay with us for 10 days and play." We would recommend Kristen to anyone. Kristen was a great sitter for our two girls 2 years old and 2 months. Even with the earthquake Kristen arrived early and was ready to make sure our girls had a great time. I really appreciated her notes on the feeding and sleep schedule of our 2 month old. We will use Kristen again. Kristen was very good with our son during a recent baby sitting experience. I would highly recommend her for prospective parents. I highly recommend Kristen! She was prompt, and great with my son. She carried him around most of the time since he decided to be fussy that day. She was such a trooper too when I ended up running late. I would certainly recommend her to anyone looking for a kind, caring, responsible sitter!